Experience the highest degree of beauty, design, and craftsmanship by browsing the Extraordinary Earrings Collection of Roman Malakov. Showcases few of the many rare, and fine pieces handcrafted by Roman Malakov. 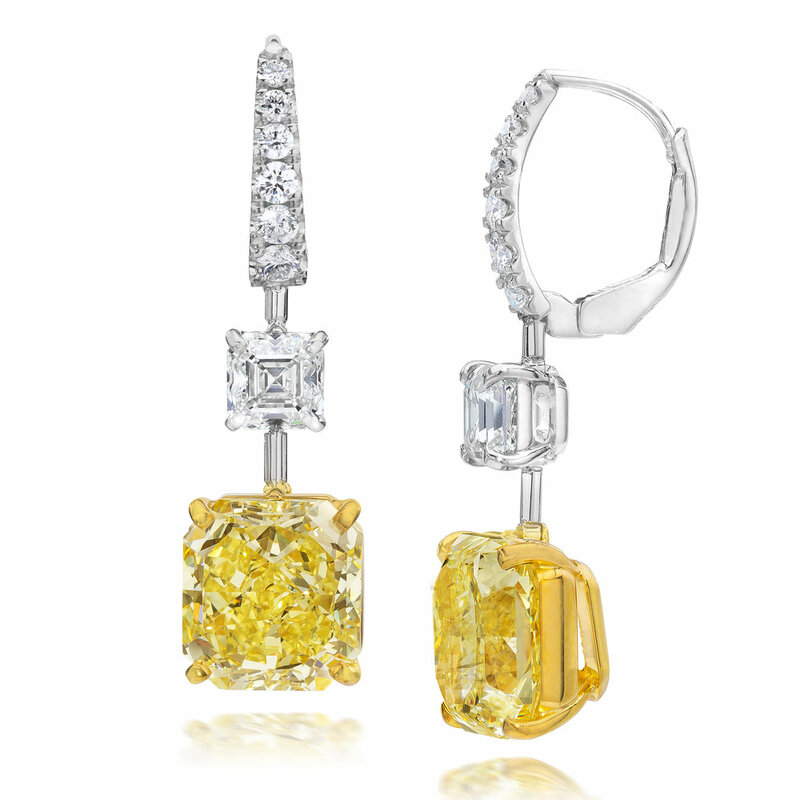 This pair of earrings features two asscher cut diamonds weighing 3.63 carats and 3.76 carats. GIA certified both diamonds as Fancy Vivid Yellow; VS2 and VVS2 clarity respectively. Each yellow diamond suspended on a smaller asscher cut diamonds. Set in platinum. Thank you! We will email or call you to confirm the appointment. An extraordinary pair of earrings showcasing colorless diamonds of varying shapes, set in an intricate, chandelier design. Diamonds weigh an outstanding 27.01 carats total. An important pair of drop earrings showcasing colorless round brilliant diamonds weighing 10 carats each. Suspended on a smaller round diamond on an accented hoop made in platinum. Bold and elegant. 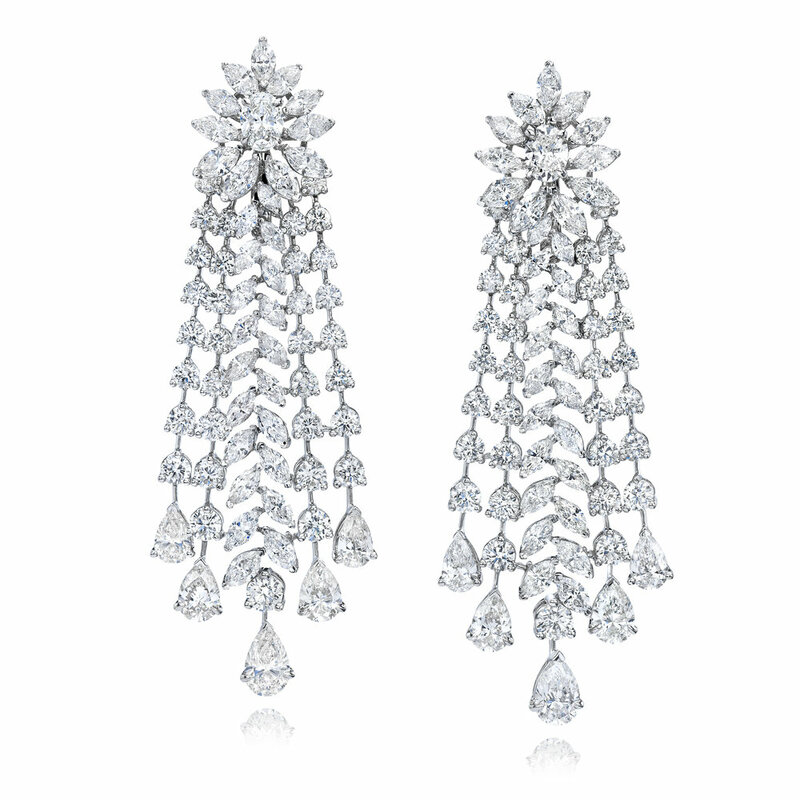 All the diamonds in these earrings are GIA certified. 6.41 and 7.10 carat pear shape diamonds gracefully drop in an everlasting platinum mounting. Each pear shape diamond spaced by a round brilliant diamond and suspended on a princess cut diamond stud. These gorgeous earrings feature two GIA certified Fancy Intense Yellow color and VS1 clarity diamonds weighing 4.38 carats and 4.10 carats respectively. On top of each yellow diamond is an asscher cut white diamond. Set in platinum accented lever back.